What Is Ageism? – Independence Through Connections. SAIL is thrilled to have Betsy Abramson, a leading expert on healthy aging, as our guest speaker for our May 15 Spring Luncheon. She is currently the Executive Director for the Wisconsin Institute for Healthy Aging (WIHA). In her role there, Betsy oversees all program development and activities, budget, partner development and program advocacy. She also serves on the Executive Committee with their research partner, CAARN (Community-Academic Aging Research Network). A lifelong Wisconsin resident with both undergrad and law degrees from the University of Wisconsin-Madison, Betsy has over 30 years of experience in Wisconsin’s aging network, previously as a public interest elder law attorney. Here’s a neat statistic from the WIHA website: People with a positive perception of aging are likely to live 7.5 more years (and those people are likely to be in a health promotion program.) At SAIL, we are big fans of positive perceptions of aging! But one thing that can get in the way of a positive perception of aging is something called ageism. You may have heard the term, and Betsy will give us information at our meeting. In the meantime, here are some things to look at if you want to start learning now, or be ready with questions for Betsy. According to the World Health Organization, “Ageism is widely prevalent and stems from the assumption that all members of a group ( for example older adults) are the same. Like racism and sexism, ageism serves a social and economic purpose: to legitimize and sustain inequalities between groups. It’s not about how we look. It’s about how people that have influence, assign meaning to how we look. In 2014, governments around the world recognized ageism as “the common source of, the justification for, and the driving force behind age discrimination. What are some examples of ageism? …and much more. 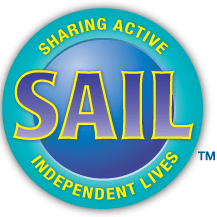 At SAIL, we believe in older adults living active, independent, connected lives, and therefore ageism is NOT okay with us! What can I do to fight against ageism? We are lucky to have Betsy Abramson at our luncheon on May 15th, as she will have lots of resources. But if you can’t make it that day, or want to get a head start, here are some resources to read and watch. Make your voice heard! Congress is currently considering many issues that affect the lives of seniors and their service providers. We need your help to make sure Congress hears how their actions impact you. Please take a moment to contact your representatives and make your voice heard. Go to this page for instructions. These videos should play on any device through YouTube. Treat Me, Not My Age by Mark Lachs, M.D. We are looking forward to seeing SAIL members at our luncheon and annual meeting on May 15th! You can register on our website at http://www.sailtoday.org. Check-in will start at 11:30 with lunch at noon and the program to follow. The menu options will be available soon; a gluten-free option is always included. Friends are welcome!